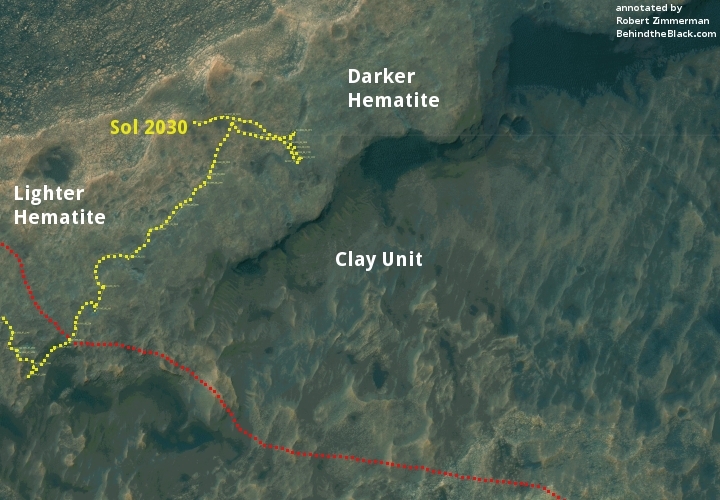 Summary: Curiosity’s exploration of Vera Rubin Ridge is extended, while an attempt by Opportunity to climb back up Perseverance Valley to reach an interesting rock outcrop fails. 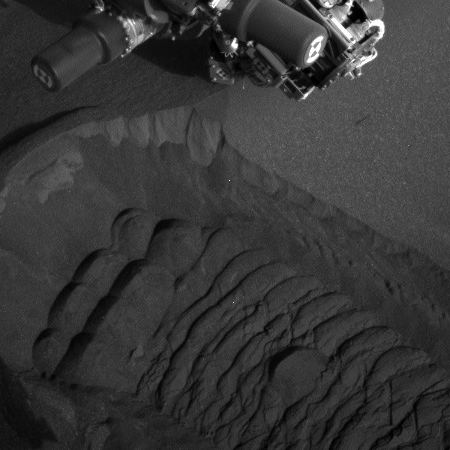 Summary: Curiosity looks at some big dune ripples, then creeps up hill. Opportunity tests its wheels. Since my last update on June 23,, Curiosity has worked its way around and, for a few days, even into the small sandy field at the base of Vera Rubin ridge. The scientists noticed that the sandy here had a series of large ripples, and they wanted to take a close look at at least one. The image on the right, cropped to show here, was taken shortly after they had the rover drive through one ripple in order to expose its interior. You can see the robot arm directly above the cut created by the rover’s wheels. On the cut’s wall several distinctly different toned layers are visible. A close look reveals that they are wavy, and probably indicate numerous and repeated overlays as the wind brushes a new layer of dust on top of old layers, time after time. The different tones indicate a change in the material’s composition, which could reveal something about some past events in either Mars’ weather or geology. In order to decipher this information, however, they will need to be able to date the layers, and figure out when each tonal change happened. I am not sure Curiosity can do this, especially since they have not scooped up any of this dust for later analysis. They are now approaching Vera Rubin Ridge, and should climb up onto in the coming weeks. At that point they will move off the Murray Formation, where they have been since March 2016, made up of dried and ancient crushed mud, and up onto a lighter, yellowish layer of rock, dubbed the Hematite Unit. This October 3, 2016 press release. gives a good outline of the geology of these regions.